Independent Study at the University of Illinois at Urbana-Champaign, completed Fall 2011. Submitted to the UIUC library system for ongoing renovation and improvements program. Understanding the pattern of human behavior in work-study environments is an important task that is relevant in the world today for implications of time, money, health, well-being and performance. The presence and location of windows in work spaces has an important influence on human behavioral factors. An outside view is found to have a positive impact on mood, performance and behavior of occupants. In this study, I investigated the influence of window locations on the sitting behavior of occupants by conducting observations of libraries and collected self reports. The observations involved recording occupant counts near and away from windows, measuring light levels at different locations and making notes of other variables that could potentially influence sitting preferences. Self reports revealed information about individuals’ personal sitting preferences as per location, seating type and library usage by time of day and function. A statistical analysis of the data gave results of user behavior in association with light levels, sitting preference by location and time of day. There was no significant correlation between light levels and sitting counts near windows. There was also no association between window locations and sitting behavior. Other factors such as proximity to electrical outlets and privacy, however, were found to play an important role in the decision making process. ​The key findings of this study are useful for future research and the design of work-study environments. Occupants prefer proximity to electrical outlets and privacy as compared to being in window seats. Effective daylight control strategies at all window locations to avoid glare and visual discomfort for occupants are necessary. Research problem and questions: What is the influence of windows on occupants’ sitting behavior in educational environments? We need to gain a better understanding the pattern of human behavior in study/work environments such as libraries. Why this question is important: Understanding the role of windows in study places is important for productivity in work environments. Knowing how to make work/study spaces such as libraries, offices or classrooms more conducive to performance and learning is essential for human health and comfort. These are the important issues that my principal research question seeks to address. Hypothesis: My hypothesis for this experiment was that windows would have a significant influence on sitting behavior; when given a choice, occupants studying, reading or writing would prefer sitting near windows. A repeated sitting pattern in different libraries at different times and light levels would lend reliability to the study, while location of the pattern in relation to windows would give me a measure of validity. At the same time, I also wanted to observe and record some of the other variables in the environment that needed to be taken into account: electrical outlets that were near and away from windows, daylight, glare, weather, indoor lighting levels and quality of light. Occupants using a laptop or similar portable devices may prefer to sit near accessible electrical outlets whether near a window or away. Overall, the goal of this experiment was to show how patterns of selecting work spaces were influenced by the location of windows along with the variables mentioned above. Research approach and Methodology: To examine the role of windows in study environments, I undertook two strategies: 1. 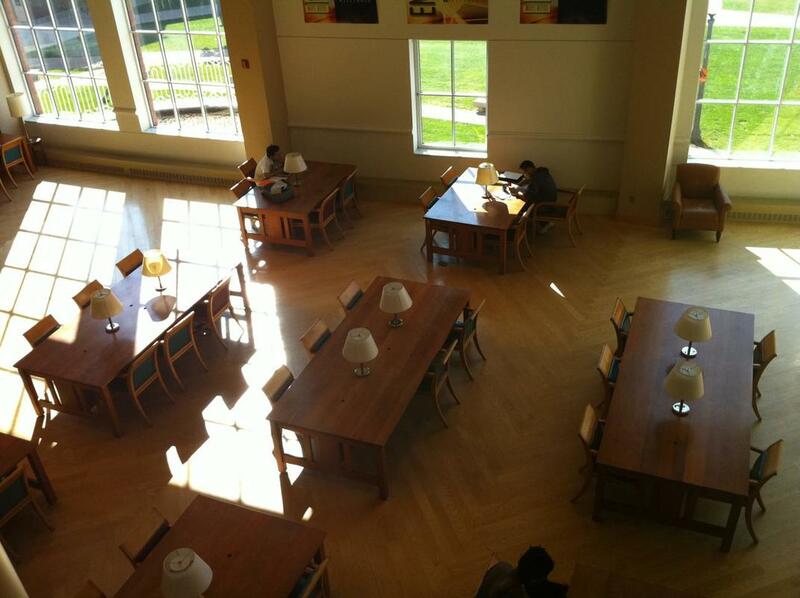 Direct observation of occupant behavior in libraries which were popular workspaces for students on the University of Illinois campus, and 2. Collection of self reports (surveys) from students working in these spaces. Direct Observation: In order to minimize any influence on the occupant behavior, my goal was to be relatively unobtrusive by sitting at a desk, making observations and taking notes. I tried to appear no different than any other student or library user, while observing different libraries at different times and noting occupants’ locations over a fixed duration of time. I thought that this would introduce sufficient variance to give it reliability- the variance of environment as well as time of the day. Lighting levels were recorded in each library using a Datalogging light meter- Extech model #401036, so that sitting behavior could be compared to lighting levels that were prevalent at that time. Locations for Observation: I studied three different libraries on the campus of the University of Illinois at Urbana-Champaign: The Grainger, Undergraduate Library and the ACES Library. These libraries provided me with variance in terms of groups, locations on campus and layouts. Each library was visited at different times of the day as well as night at 4 different time slots: Morning (5 am to 12 pm), Afternoon (12 pm to 5pm), Evening (5 pm to 8 pm) and Night (8 pm to 10:30 pm). In this way, there were 12 total visits for observation. Each period of observation typically lasted for an hour- this included about 45 minutes of observation and 15 minutes for set up and changing vantage points. Since these libraries are of considerable size, I selected a smaller area and documented my observations on an observation chart which had detailed categories for recording the time, date, weather outside with sky conditions, library section that I observed, locations where people were sitting, the type of seat and typical light levels at those locations. Measurement of Light Levels: I recorded the light levels with the help of a Datalogger light meter- Extech model #401036 with a range of 0 to 20,000 lux. In order to compare lighting levels with and without daylight I also took readings of electric lighting levels at night time. To minimize error, I took three light readings at each location that consisted of a specific type of seating- a table, armchair, study carrel or computer workstation and calculated the average. This average was used in the data analysis. The industry: This study has useful implications for architects, interior designers, campus planners, facilities and maintenance personnel, and library staff and management. Excessive glare: At different times of the day depending on the orientation of the particular library section, excessive glare was observed near windows due to the penetration of direct sunlight. This phenomenon was observed very clearly at Grainger library which has a south facing commons reading area with extensive glazing along a curved wall. I recorded very high light levels in Grainger due to daylight at the windows in the evening when the sun was low. As excessive glare results in discomfort for reading, writing and computer tasks (IESNA 2000), it may have been one of the reasons why occupants chose to sit away from windows. Daylight control: The issue of excessive glare in libraries is directly related to the provision of daylight control. All the lighting levels documented in the results above showed strong evidence of a lack of daylight control across different libraries. In Grainger library, it was observed that the windows have been provided with roller shades to control sunlight, however these are either not operated or non-operational most of the time. They appeared to remain open throughout the day. In the undergraduate library, there was some degree of control of roller shades by users; however it was arbitrary and sporadic. For example, they were observed to be rolled down at night time when it was not necessary at all. Glare control was a lesser problem at ACES, probably because the octagonal footprint helped in minimizing direct sunlight through the glazing surface area of many different windows at the same time. Users’ sitting preferences: Survey results showed that library users preferred proximity to electrical outlets as the first choice, privacy as the second and proximity to windows only as their third choice of location preference. This may be because there was a high percentage of laptop users who needed electrical outlets and students preferred privacy for quiet studying purposes. This points to the fact that digital device usage has taken precedence over traditional studying methods such as reading books. 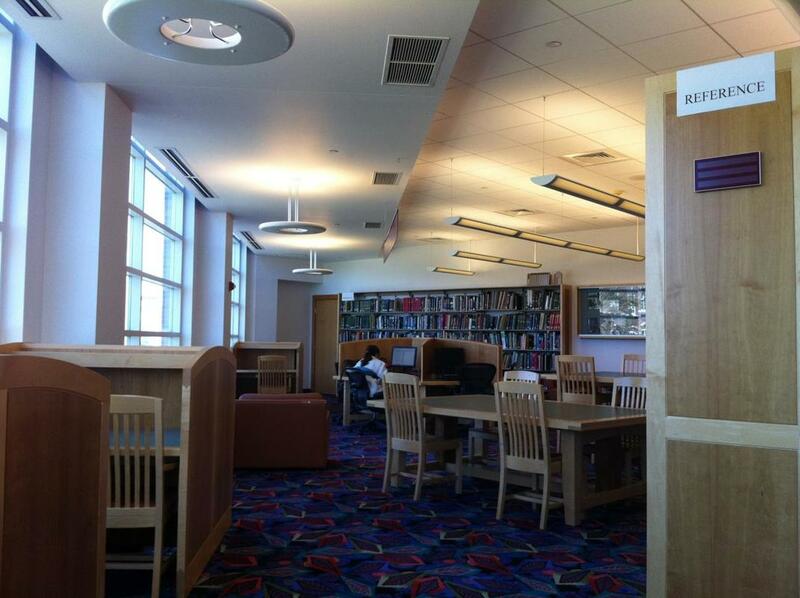 Library design: It was observed that the library layout played a significant role in deciding where the occupants sat. 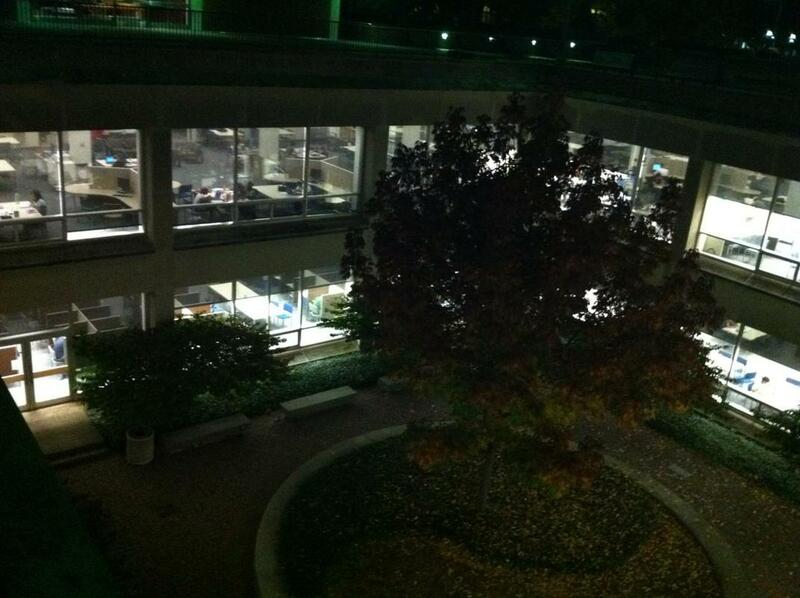 For example, the Undergraduate Library had very limited seating around the windows at the courtyard. Therefore there were more users sitting away from windows simply because of the availability of seats. ACES Library on the other hand, had more tables around the windows at the perimeter because of the layout in which the circulation core and stacks were arranged at the center. The Grainger library commons area had a good amount of seating at the windows; however there were issues of visual discomfort as discussed above. Daylight control: Provide glare control mechanisms at windows in order to avoid undesirable study conditions and human discomfort. Seating Layout: Provide an equal number of seats next to windows and away from them in order to lead to a more reliable comparison of counts. Design types: Conduct the experiment across a variety of educational environments such as classrooms, offices, libraries and public spaces such as atria and lobbies. This will introduce more variation and increase the reliability of the experiment and validity of end results. Electrical outlets: Select environments where electrical outlets are equally distributed throughout the room i.e. where an equal number are located near windows as they are located away from windows. The study of window influence on occupant behavior in educational environments reveals that it is an interesting and complex phenomenon to study, It gives us useful insight into human behavior that can lead to valuable design implications for work and study environments which in turn may have a positive influence on human health, behavior and performance.